Are you planning a family vacation at the beach anytime soon? Or are you one of the lucky ones that live in Myrtle Beach and are looking for an unusual gift to give a loved one or friend for Valentine’s Day? Have you thought about giving them the thrill of a lifetime? Give A Myrtle Beach Jet Ski Rental for this very special day. What can you expect with a Myrtle Beach Jet Ski Rental? 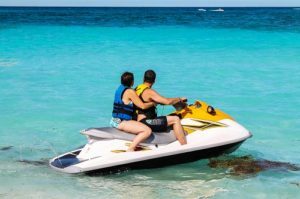 Whether you are visiting Myrtle Beach or you live on the Grand Strand, there is no better way to cruise the area than on a jet ski. Action Water Sportz offers top of the line jet skis for your safety and for hours of fun. Don’t worry if the person you have in mind for this awesome gift has never been on a jet ski before. An experienced guide accompanies every group that departs from any of our three great locations. We also provide a complete safety and instructional time prior to leaving the dock. What are some of the highlights of renting from Action Water Sportz? You can ride alone or with up to 3 people on the jet ski. This means you can bring along your kids for a day they will never forget. Cupid on Jet Ski Myrtle Beach. So why not forget everything else and stay home and relax – call Action Water Sportz today to book your jet ski rental for Valentine’s Day. Then go to the nearest shop for a boquet of flowers or maybe a couple’s shirt. Your special someone will love it and they will have something to look forward to. We had an awesome time this morning with our tour guides, Mark and Bryan. They kept us safe. We enjoyed the view. Unfortunately, it was a little rough so we didn’t get to see Dolphins but they did take care of us in the rough waters. And we so will be doing this again in the future and hopefully will have the same guides. Do you have a large family group that would love to go jet skiing? Call us today to schedule a time just for your group. You will have a blast and your family will talk about it for years to come. Call today to schedule your jet ski rental for Valentine’s Day – your special someone will thank you!